OK, so recently the 5 millionth topic was opened about storage. 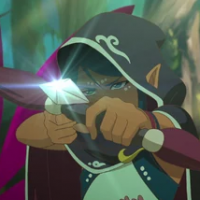 Let's keep it all to one sub-forum and one topic. 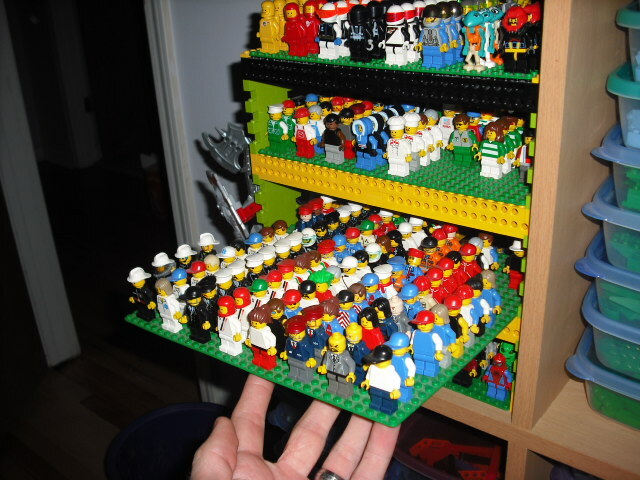 How do you sort your LEGO? By color(soon to be further). 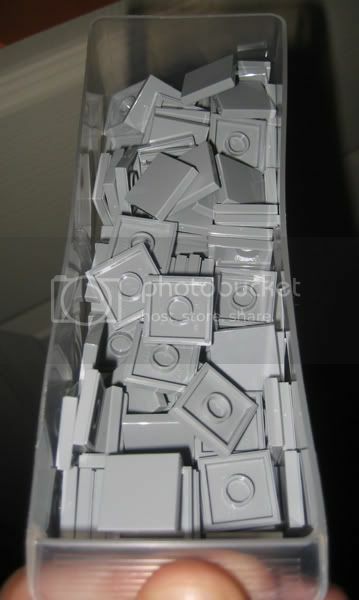 Would anybody recommend this brand for LEGO storage? I find those compartments to be too small. I had something similar but ended up ditching it because those compartments filled up way too fast. I just don't need to sort that specifically. There becomes a point where you can't find things because they are too sorted, if you know what I mean. Anyway, I've been on a massive crusade of sorting. I'm using those 7 drawer towers you see a lot of, with office drawer separators in some of the smaller drawers for my really tiny bits. I'm guessing I should have around 6-8 of these towers full by the time I'm done. It's a heck of a lot of work, but it's rewarding to see it come together. I will for sure post pics when I'm done. Yes. It is what I use. What exactly is the one you have? A lot of customer reviews are saying that the drawers are opaque rather than clear like yours are. Also I'm not really sure what size to get. What exactly is the one you have? A lot of customer reviews are saying that the drawers are opaque rather than clear like yours are. The clear ones in his picture are probably a few years old. These drawers used to be better at one point, made of a higher quality plastic (which looked clear instead of translucent) and including some dividers for the drawers. 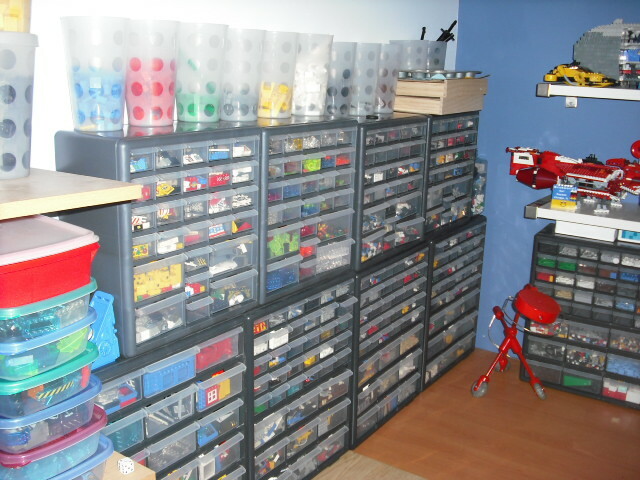 Despite that, they're still the best option for storing and sorting Lego, if not the most economical, and are apparently TLG's own preferred choice. That Amazon price is quite high though. Home Depot sells the 30 small/9 big version (seems to be the most useful overall) for $18. It seems that a few other companies have similar products available on Amazon. The Akro Mills ones have gotten better reviews on there and seem to include dividers, although they cost more and are still made of the cheap material. Yay! A new "important topic"! Since I have almost no LEGO, I just use these clear plastic containers by this company called "Holiday Housewares Inc." I just keep my small sets that are around $10 in them. I can't find any pictures of it...I can't even find the company's website. The 9-drawer unit. I have a couple of these, which sell for $10. The 30-drawer unit. I have most in this size, which also sell for $10. The 39-drawer unit. It's a combination of the first two, so naturally it sells for $20. They have an extremely small level of opaqueness to them, almost unnoticeable. But it's because they're made from a really soft, durable, flexible plastic. Rather than some kinds I've seen made from that hard, brittle plastic that is prone to cracking. As you can see, it in no way inhibits your ability to see inside of the drawers. I bought all of mine at Sears and Wal-Mart in their hardware departments. I have to run out for a bit, but when I return later, I'll post some more images of how I've sorted the drawers out and some other containers I use. I have 5 of this variety, which are enough cover my spare parts stash (along with the Technic storage case from 8062 and a UCS Batmobile box for large wheels and panels). Most of mine are the older kind with the hard, clear plastic, but it doesn't crack and actually feels more solid and robust. I got four in 2003, and a fifth one with the flexible plastic last year. I just noticed that you can buy the dividers separately on Amazon (as I mentioned earlier, the drawer sets don't include them for free anymore). 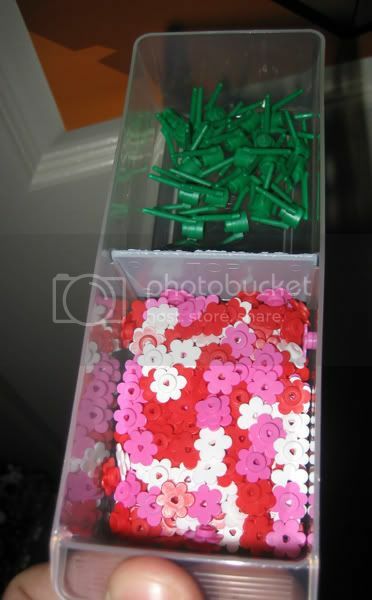 You would need to have at least two or three of these drawer packs to make the dividers worth the cost though. 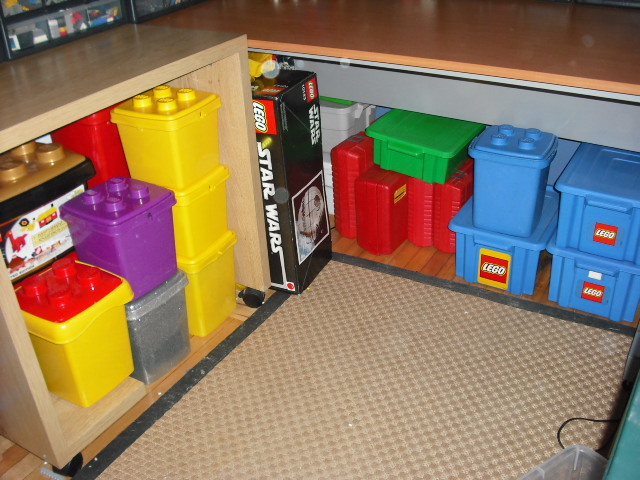 The nice thing about all of these is that the width of the small drawers is almost exactly 6 studs, so Lego bricks can be packed into them nicely. It looks like the 39 drawer set will work best for me, even if it is a little pricey. Thanks for all of the information. Are they cheapest at Home Depot? A wooden mini drawer set. Ikea storage boxes. DIY screw sorters, gatchapon eggs, the inserts from the lego Advent Calanders i have and the mesh/net bags that clothes tablets for washing machiens go in. No. They are cheapest at Wal-Mart and Sears. I found that when I was deciding how to organize my collection, I spent a lot of time looking at how other people did it. When I first started collecting, I knew that I was going to be buying a lot rather quickly, so I had to develop a system of organization early on. Given that, even as meticulous as I am now, I find that it gets away from me rather quickly when I buy 4-5 sets at once. Even as we speak, I still have Roughly 15 unopened sets in my closet I haven't gotten to yet, 5 of which are over 1,000 pieces. I even have some sitting in the floor that I've decided to remove from display but have yet to dismantle. It really is an endless job, but luckily a fun one. Here are some other examples of how I organize my things out. The drawer sets come with dividers that can be inserted optionally. I don't use them in all of the drawers, naturally, but sometimes, as in this case, it is extremely helpful to have. I have to be careful what I put in the back though, as it may make things confusing later. But as with this picture, it's a pretty logical connection. I've yet to label the drawers as I haven't found it extremely necessary, but I've not ruled that out just yet. When undivided, you can see the slight bend in the drawer due the malleability of the plastic they are made from. It's pretty inconsequential as the divider bends it back in shape, or the contents of the drawer will. I use a LOT of these bins which I purchased at Wal-Mart. I've seen them in Wal-Mart stores across the nation, and everywhere I go they sell for the same price, $1. Such a cheap price makes purchasing them in bulk a lot more reasonable, same with my divided containers. 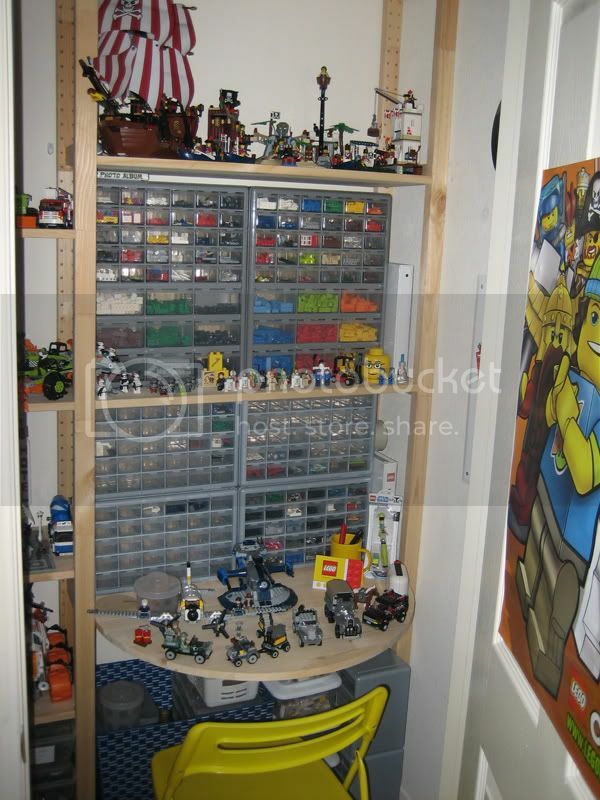 Really, the only "pricey" investment in my LEGO room were the drawer sets and the shelving units I built to house everything. That, and of course the LEGO sets themselves. 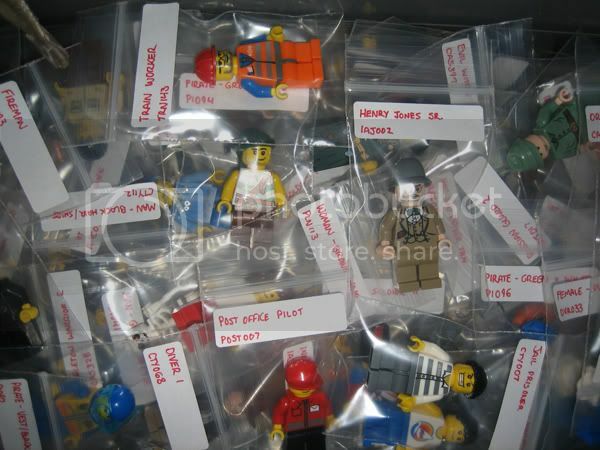 As far as minifigures go, I bag and label each individually, sans accessories, as they are cataloged on Bricklink. Unfortunately, I've yet to decide exactly how I'm going to separate them beyond this point, probably by theme, and I'm not sure what I will store them in. As of now, I've got about 3 of those shoe box sized bins with the white lids full, totaling about 800 figures, which I think really speaks to the capacity of these boxes. So, it's getting to be about time I decide what I'm going to do, lest I be overwhelmed. Naturally, storing the figures does not mean I don't keep any on display. Usually I'll keep several army or collections of figures on display. Right now I've got my Rock Monsters and a growing Clone army on display. Generally when I dismantle a set I'll take time to bag the figures as well. But when I rotate things in and out of display, the figures are displayed with the set as well, as one would expect. That's really the rundown of how I do things. It's perpetually changing in there as my collection grows every week. I've stored roughly 180 sets (50,000+ parts, 800 figures) in there, as well as countless PAB cups and parts by the pound from LEGOLAND, between displays and tucked away in the boxes. Like I said, it's a never-ending job as I'm constantly purchasing new sets and loose parts. But really, without this organizational system I'd not have access to the things I want on demand, which is really what it is all about for me in the end. I will never be quite that organized. But I'm going out to buy some of those stack-on bins now. There aren't any on the Wal-Mart website... are you sure Wal-Mart has them? We have three Wal-Mart stores in our area, and two of the three carry them. The other one carries a similar container, but I don't like it as much. I also went to a few Wal-Mart stores recently in the Chicago area, and a few in Kentucky, and they had them as well. So, they are in various areas as well. You might just have to see. Otherwise, a suggestion would be to ask customer service. Wal-Mart tends to carry products when people ask for them, even if only one person asks. They tend to be pretty good about that. Well, I just went to my local Home Depot and Wal-Mart, and neither stores carried the containers. An employee at Wal-Mart told me that they used to have them but not anymore. I'm starting to suspect the product has been discontinued and that's why the amazon priced is so high. I'm barely out of my dark ages, so I don't yet have a storing system. Algernon, I think that Kmart or Target will carry what you are looking for. I personally find that the Akro Mills containers have a slight flex to the plastic and as such do not easily break, I have broken/cracked some of the stack-on variety. Both are nice though. Clear fishing tackle/bead/sewing boxes work really well too and can be found at any department store with the fishing tackle version over in sporting goods usually the cheapest. Those are great for smaller pieces. 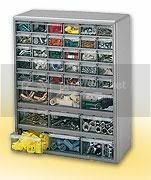 For common parts such as bricks, plates, and slopes I recommend buckets or the larger slide drawers. The absolute cheapest way to sort is to use bulk plastic bags which can be purchased for as little as 0.01 per piece and free cardboard boxes for anyone who will give them to you. 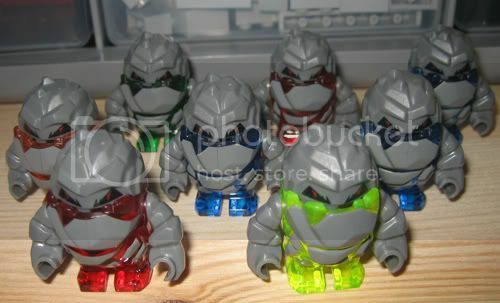 mania3, you should consider opening a Bricklink store and selling. 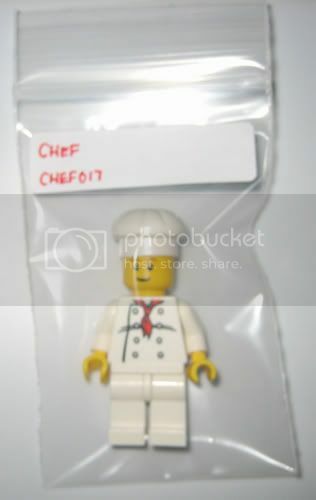 Minifigures are easy to sell, and unless you want them generally, that would be a great way to earn some extra money for more of the LEGO you do want. Most sellers do not have inventory so neatly sorted; as such, you are ready to begin selling if you so desire. It would also put you back in control over what parts you want and how to store them. Thanks for sharing your organization techinques mania3! I might want to start "cataloging" my minifigures like how you did. I just use clear plastic shoe boxes. I dump each kind of color into a different box (unless there are small ammounts, then they go into ziplocks). I just take a mental invintory! No problem, it was fun sharing. I'm pretty proud of the work I put into it. It makes things extremely accessible for me. Since we are collecting all sorting discussion, here's how I sorted mine. I keep "special" pieces sorted by type in 8 large,and 4 small drawer containers. 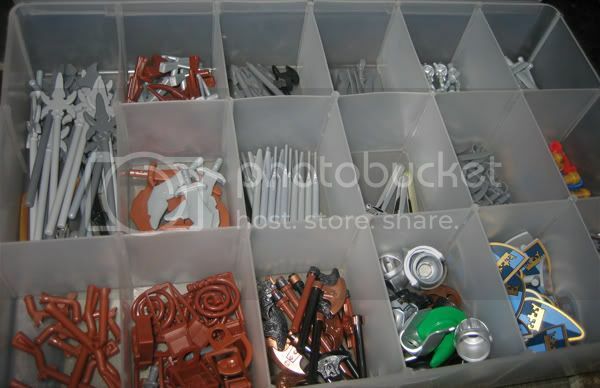 This includes things like clips, hinges, minifig parts and accessories, tiles, rounds, etc, etc. Everything else gets sorted by color and type (similar types often mixed). 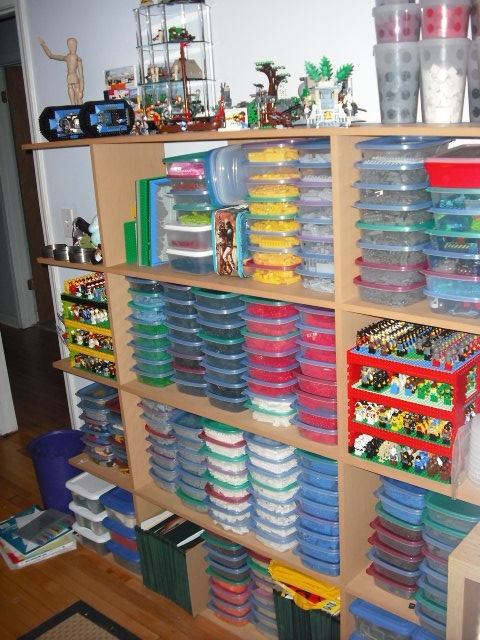 Most pieces are put into cheapo dollar store microwave containers and stacked on a shelving system. 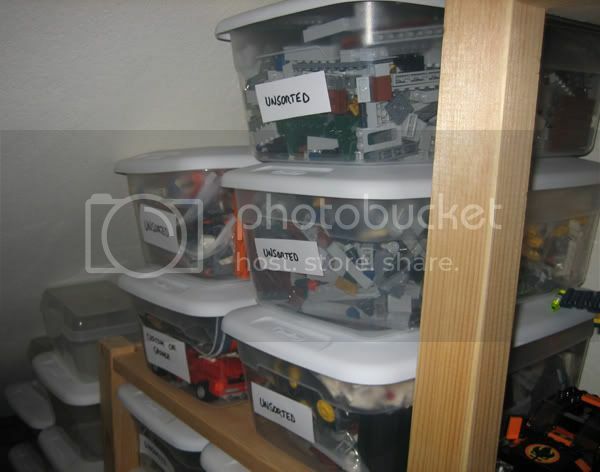 Bricks that I have alot of in one color and type, are placed in freezer bags and put in one of 19 LEGO suitcases, tubs and buckets. 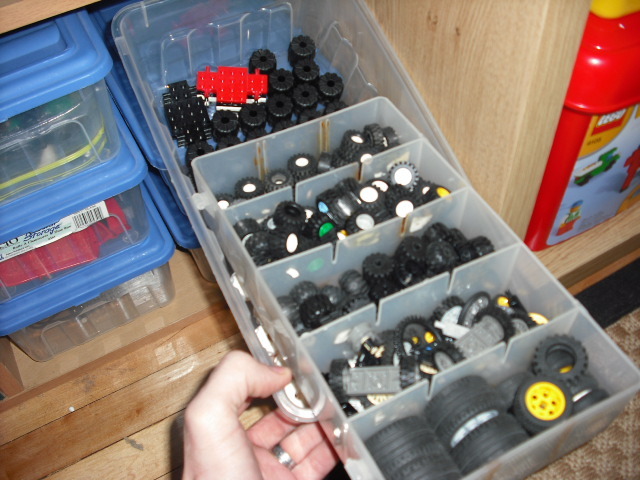 I also use 8 of the plastic shoeboxes for sorting large or numerous special pieces like BURPS and LURPS, wheels, castle walls, etc. Where do you get those bags? Mine are stored in a 4 draw tower. Michael's craft stores. But here is the product if you want to look for them elsewhere. They're just a simple 2x3 in. craft bag that can be found at nearly any craft store or department store's craft section. Also, Eilif, I've seen pictures of your collection floating around and always thought it was very impressive.